Spiral galaxies are flattened disc-shaped systems incorporating spiral arms of perhaps up to 100 billion bright young stars embedded in interstellar matter winding out from a dense central nucleus. Although two-armed spirals are the most common, one- or even three-armed systems have been observed. There exist normal spirals, with arms emerging directly from the nucleus and barred spirals, in which the arms emanate from the ends of a bright central bar across the nucleus. Both of these types exist in a wide range of forms from large dominant nuclei with thin, tightly bound spiral arms (Sa,SBa), to tiny nuclei with large, loosely bound spiral arms (Sc, SBc). 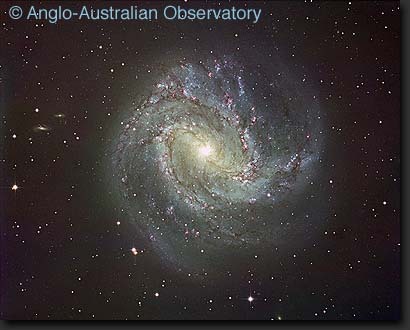 Spiral galaxies are rich in gas and dust, distributed mostly in clouds along the spiral arms. The nuclei are seen to contain older stars, which extend in a fairly smooth axially-symmetric distribution beyond the nucleus, but because of their intrinsic faintness, are much less conspicuous than the arms. How do Spiral galaxies appear in X-rays? 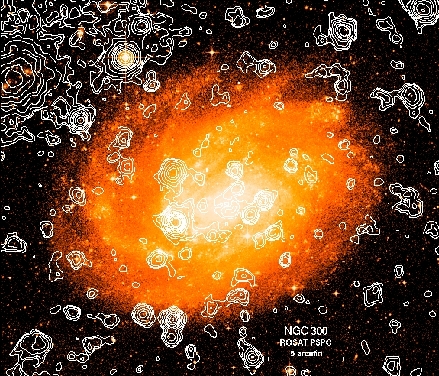 IMAGE:- X-ray emission from the spiral galaxy NGC300. Contours of X-ray emission are shown superimposed on an optical image. Many point sources are visible, including a possible black hole binary and many supernova remnants. NGC300 is a very quiet galaxy, and shows little in the way of diffuse gaseous X-ray emission. More active spiral galaxies show a larger diffuse X-ray contribution from the hot interstellar medium. Spiral galaxies are spatially extended, complex X-ray sources with X-ray luminosities ranging from 1031 to a few times 1034 watts. Although this is only a small fraction of the total power output of a galaxy, the X-ray data can be used to study the end products of stellar evolution, such as compact objects (e.g. close accreting binaries and black holes) and supernova remnants, and also the hot interstellar medium (ISM), the gas which surrounds and encompasses all the stars within the galaxy. The distribution of X-ray sources can also be studied, especially in nearby galaxies, placing constraints on binary evolution theories, and also the structure of the ISM can be investigated using observations of diffuse X-ray emission from the planes of spiral galaxies. Studies of this hot gas are of great help in the development of supernova remnant evolution theories.